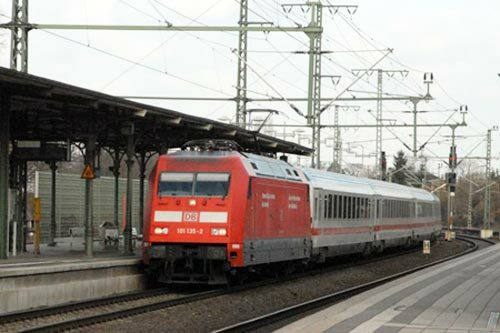 The rail journey from Hannover to Berlin takes around two hours using inter-city trains. Don't expect interesting scenery as the route crosses a vast plain however the trip does provide a look at what was once part of the DDR (East Germany) and ends in the new Berlin Hauptbahnhof, which must rate as one of the finest modern stations in Europe. Hannover main station is a busy interchange although on the date of travel there was a strike by some railway employees and many local and S-bahn services were not operating. Due to this there were fewer people travelling and many platforms were strangely devoid of life. The train arrived from Osnabruck on time and was formed of the current loco-hauled intercity stock. With a reserved seat in an open coach, I was ready to enjoy the journey through the large windows. Passenger comfort is high even in second class with more than adequate legroom, wide seats and reclining seat backs. Good sound insulation means there is little noise too. Departure was on time at 0921 and we were soon speeding through Hannover's suburbs. Out past the extensive marshalling yards at Lehrte and on towards Wolfsburg the home town of Volkswagen. A brief stop and off again towards Berlin. Today it is hard to see the old east-west German border although soon after leaving Wolfsburg you pass Oebisfelde station on the right hand side. This was the first station inside the former East Germany. Trains between West Germany and West Berlin were subject to the Transit Agreement of 1972 and ran non-stop through the DDR. From Oebisfelde the scenery is not very exciting with wide open plains on both sides. For railway enthusiasts you will note the parallel line on the left which still carries local trains. This passes large derelict stations that were once operated by the Deutsche Reichsbahn. You soon reach Stendal, which is bypassed by the main high speed line. On my last visit in the late 1970's there were steam locos here working freight and local passenger trains. There is still the old roundhouse on the left side just before the station and I believe the locomotive repair shops are still in use at this important junction. On departure you rejoin the main line and head non-stop to Berlin-Spandau station which was just inside the boundaries of West Berlin. Alongside you will now see the distinctive Berlin S-bahn trains as you head towards the city centre. The railway runs above the houses and you get extensive views of Berlin as you approach the main station or Hauptbahnhof. This two level station has a wonderful overall roof with excellent use of stainless steel and glass. It's a great place to end a journey as you feel you have arrived somewhere special.